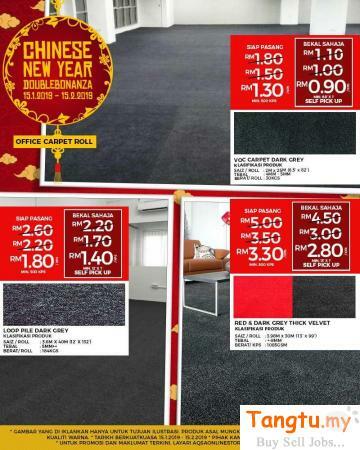 » GET THE BIG SAVING ON OFFICE CARPETS BY OUR CNY SALE!! GET THE BIG SAVING ON OFFICE CARPETS BY OUR CNY SALE!! Here at Alaqsa Carpets, we stock a wide variety of colors and styles to choose from, you’re sure to find the best carpet to complete your home or office look. Price Starting From RM0.90/sqft only. We Send You The Price Immediately.